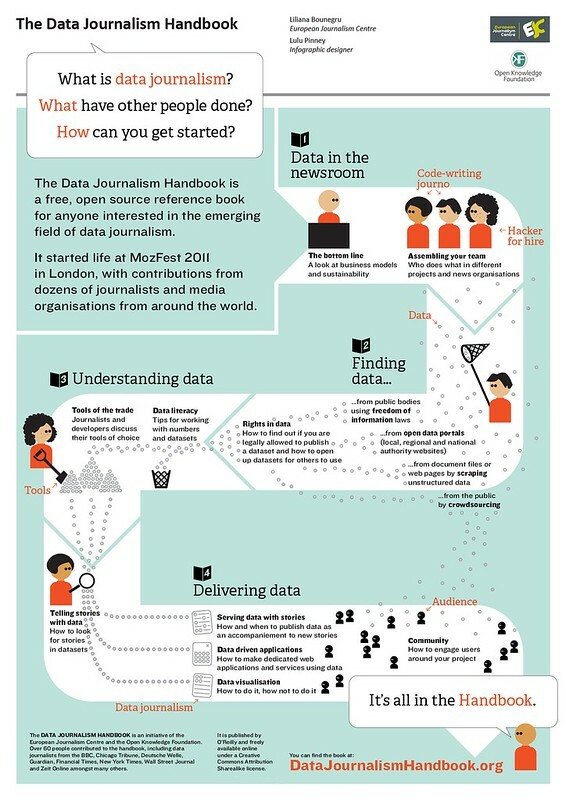 Freelance infographic designer Lulu Pinney has kindly designed a wonderful poster which illustrates some of the topics covered in the Data Journalism Handbook, a free, open source reference book which shows how journalists can use data to improve the news. She uses a process diagram to represent different aspects of the data journalist’s workflow – from getting data to delivering it to their readers in stories, visualisations and apps. The poster will be presented at the Information Design Conference 2012 in London. The design is based on Kate Hudson’s illustrations for the book. The first edition of the book is nearly completed, ready for its launch towards the end of April at the International Journalism Festival in Perugia. If you want to be notified when the book is released, you can sign up on the website. This entry was posted in data, datajournalism, datajournalismhandbook, design, open data, projects. Bookmark the permalink. Comments are closed, but you can leave a trackback: Trackback URL.